Dining and Nightlife in Charleston reflects the opulence of the Charlestonians - lavish yet warm and friendly people. Charleston is a preserved historical city, showcasing elegance from its rich culture. As a visitor, indulge in her unique lifestyle to discover her beauty. The best way to appreciate the historical Charleston City is by taking a historic tour. You and the whole family will surely love the varieties, such as walking, carriage and water tours. Listed here, are just some of the year round exciting outdoors. Our accolades include a "Must Play" by Golf Magazine, and a "4 Stars" from Golf Digest. Just a short drive away from Charleston, the Coosaw Creek golf course is an Arthur Hills classic with gentle rolling fairways, subtle mounding and gradual elevation changes. The golf course places a premium on accuracy over length. Precise approach shots and a deft short game - avoiding the greenside bunkers, the dense woods, and wetlands - are the the keys to scoring. The Coosaw Creek golf course challenges you to fire at the pins, which are protected by greenside bunkers, woods, and wetlands. Any miss-hits will require an exacting chip from a strategic bail-out area to save par. The superb shot values on Coosaw Creek golf course are overshadowed only by the sheer beauty of the site. Rolling seamlessly from woods to wetlands, the course offers a variety of different looks and presents golfers with a memorable experience at every turn. Surround yourself with marsh vistas, glistening dunes and crashing waves. That's golf at Wild Dunes Resort. Guaranteed to test you every day. Here, we celebrate the great old game in style with 36-holes of the Harbor Course and Links Course. Challenging enough for players of every skill level. Golf Digest says they're among the "Best in the State." Tom Fazio designed our courses early in his career, and says they're still among his favorites. Another Tom Fazio design, the Harbor Course will tease and test your skills as a player, particularly challenging your shotmaking skills and strategic thinking. 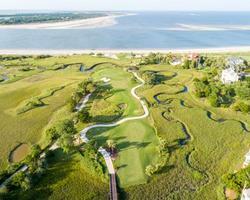 Water comes into play on nearly every hole as fairways skirt saltwater marshes, lagoons and the Intracoastal Waterway. Surround yourself with marsh vistas, glistening dunes and crashing waves. That's golf at Wild Dunes Resort. Guaranteed to test you every day. Here, we celebrate the great old game in style with 36-holes of the Harbor Course and Links Course. Challenging enough for players of every skill level. Golf Digest says they're among the "Best in the State." Tom Fazio designed our courses early in his career, and says they're still among his favorites. Tom Fazio's first solo design is ranked among the world's best, year in and year out. With its rolling fairways framed by moss-bearded live oaks and rustling palms, the Links Course is as much a visual bounty as it is a golfing challenge. Noteworthy for massive, humpbacked sand dunes and finishing holes along the Atlantic Ocean, the Links recalls golf's ancient Scottish heritage. A beautiful coastal Carolina country club, located in Mount Pleasant on the Wando River and surrounded by miles of marsh views, RiverTowne Country Club features the best of Arnold Palmer's signature designs and low country hospitality. Recently the host of an LPGA Tour event, this semi-private golf club offers both a top resort golf experience and traditional memberships. This semi-private golf course features beautiful pampas grasses, marshlands, lakes and some of the Lowcountry's most beautiful vistas and landscaping, including a plethora of classic southern Live Oaks. With a high 4.5 Star Rating by Golf Digest's Places to Play.